Katie’s Krops now has 100 gardens growing across the country and has donated thousands and thousands of pounds of fresh produce to people in need. The mission of Katie’s Krops is to empower youth to start and maintain vegetable gardens of all sizes and donate the harvest to help feed people in need, as well as to assist and inspire others to do the same. CeCe, who is a Katie’s Krops grower in Urbana,MD. She first became connected to Katie’s Krops, two years ago while watching “The Chew” with her mom and saw Katie Stagliano on one of the episodes. After hearing Katie speak about her mission, CeCe knew she had to apply. That night, with the help of her mom applied for a grant and has been blessed to be part of the KK family. Since the age of 3, CeCe has always had a passion to help others. CeCe donates 100% of her harvest to families in need of food. 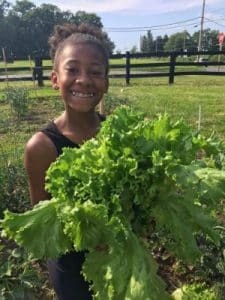 Starting at the age of 10, she began with 3 donated plots by her local Twin Hills Community farm and presented a proposal to elementary school last year to revitalize their school garden. With the help of the STEM teacher, she has engaged 22 other students to start a Garden Club that meets twice a week during the school year. During the off season, she hopes to hold a food drive. Last year, CeCe donated over 500 lbs of fresh food and with the help of the gardens at the school, she has set her goal to 1,000 pounds. CeCe will be moving on to the middle school, but the principals at both schools have agreed to bridge the gap and work together, by expanding the garden at the elementary school and building a garden at the Middle School. She is very dedicated to the mission of Katie’s Krops and appreciates the help from her classmates. CeCe serves on the Katie’s Krops Youth Advisory Board and has partnered with the University of Maryland extension office for additional resources. 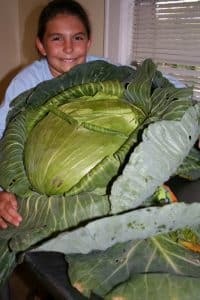 She passionately donates her harvest to the seniors in her community and to the Frederick Soup Kitchen and Pantry. Her dream is to open her own restaurant, where she can offer free meals to feed families in need on specific days out of the month.